New Macbook Power Adapter for MagSafe 2! We now have a 100% working and tested power adapter for MagSafe 2 / MagSafe 2 laptop adapter tip! It’s taken a while but we’re happy to be able to show you a product that is safer, more reliable and more robust than even official Apple chargers – enjoy! Due to Apple changing the design of the power port periodically, it can sometimes be difficult to keep up to date with the times quite as quickly as we would like. Added to this is Apple not releasing specifications for how to replicate their own charger adapter tips, which means if a decent MagSafe adapter tip that passes all our standards is to be produced it requires months of R&D and testing. 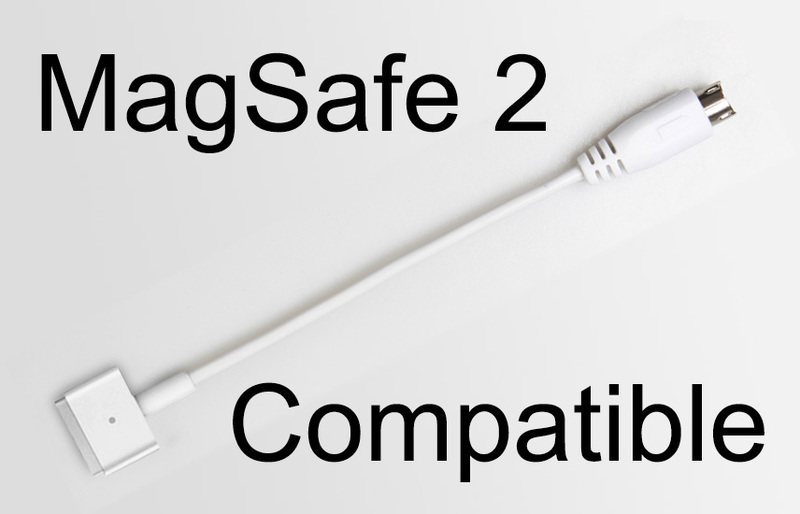 Now, though, the wait is over and we have the N37 laptop adapter tip for MagSafe 2 / MagSafe 2 charger! 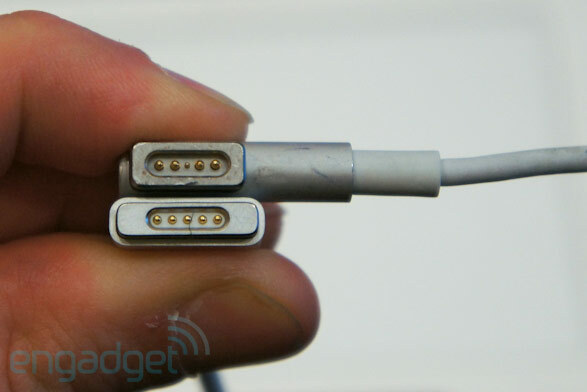 The new tip is designated N37, and works with the newer design of Apple’s MagSafe 2 adapter tip. There’s a minor but important difference between the old a new MagSafe tips, and you can tell yourself which one you need by quickly glancing at the image below and comparing it to your own MacBook or MacBook Pro. You can check out Engadget’s news article on the introduction of the stealthy introduction of the MagSafe 2 charger here. The top ‘older’ design is the MagSafe 1. The newer, snazzier design underneath is slightly wider and also has all the pins of the adapter tip the same size. Apple actually originally introduced this quietly in late 2012 on some of the newest generation MacBooks with Retina Displays, but didn’t make much fanfare about it. Of course, once users realised their old chargers wouldn’t work with their new computers you then found out that you need to buy an adapter to move between them, which can cost up to US$30 / GBP£20 if you buy it from the official store. This is an extra cost on top of the Apple MagSafe 1 charger / Apple MagSafe 2 charger itself. A quick Google for “magsafe power adapter” shows the official Apple store close to the top of the results, with an average review of under 2/5 stars and a price tag much higher than Imperial Gadgets’ (and if you walk into an Apple store, as recently as January 2016 we’ve been quoted £85 for a power adapter for MagSafe 2!). The cables simply fray too easily. Most people pack their MacBook charger in a bag and roll the cables up, which if done carefully shouldn’t damage them. However, over time (longer than 3 months) the plastic casing around the cables becomes surprisingly brittle, especially around the power adapter for magsafe 2 itself, and many people complain these power adapters have a really short usable life if you’re out and about often. These power adapters are way too expensive! The high street Apple stores charge an arm and a leg on these products, and take advantage of people not knowing where else to buy the chargers because they aren’t universally sold everywhere. There’s an argument for buying one and never having to buy one again if the quality’s great, but lots of people keep reporting they break on a regular basis! For these reasons we are proud at Imperial Gadgets to be offering the new N37 power adapter for MagSafe 2 – this brings our universal laptop charger in line with all current Apple MacBooks and MacBook Pros in terms of compatibility, with a charger that is safer, more reliable, and more robust. Pick yours up here!